It can be hard work trying to get your head around developments on America’s passenger railways. The national state operator Amtrak lurches from one financial or operational crisis to the next, providing long-distance services that often seem of more interest to tourists than American citizens. Yet somehow it carries on despite delays on services which can run into the hours, rather than the minutes, and trains which run once a day, calling at many cities in the middle of the night. In contrast, many of its stations are either incredibly well-maintained historic survivors, or impressive new constructions. Partly the explanation is that while national rail might be staggering along apparently in imminent fear of collapse, local rail seems to be doing quite nicely in some places. And when I say local rail, I mean at the state level, so the distances covered by ‘local’ trains in America wouldn’t disgrace those on inter-city routes in many European countries. 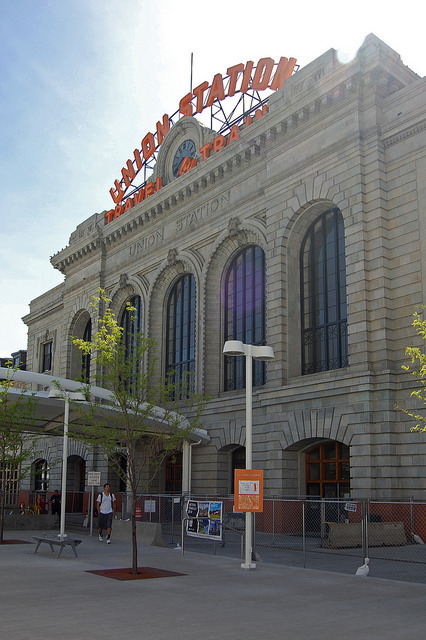 One such success story comes from the Mile High City of Denver, Colorado, which is now in the final stages of opening/reopening its thoroughly modernised Union Station. Despite the sudden and massive decline in long-distance railroad usage as Americans switched to cars in the post-Second World War boom, many cities retained commuter rail networks, connecting them to other settlements in their economic hinterlands. It’s a model that is slowly becoming more popular again. Denver is just the latest city to turn to commuter rail in its attempt to relieve road congestion and provide a more sustainable alternative to car use. Local transport authority RTD has planned a network of four commuter rail lines, plus other light rail lines, under the FasTrack project umbrella, with the first two due to open in 2016. 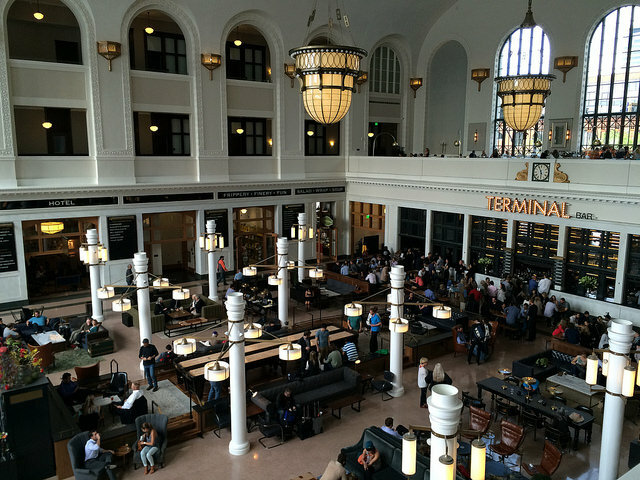 At the heart of this new network is Denver Union Station, a famous local landmark. Much photographed is its illuminated “Travel by Train” sign, erected in the 1950s in an (unsuccessful) attempt to stem the post-war decline in railroad passenger traffic. The only trains to serve the station in recent years have been the two California Zephyr services (one each way) per day, on the Chicago to San Francisco route. This is one of Amtrak’s wonderful Superliner services, which takes several days to complete its journey. It is formed of double-deck coaches, many of which feature sleeping compartments and which are complemented by a high quality restaurant car, as well as an observation car. The existing Union Station building is grand, but architecturally a bit of a muddle. After previous structures caught fire, a new station was built in 1894 in Romanesque style. However, it eventually proved not to be quite grand enough, and the centre part was rebuilt as a larger ticket hall in 1914. This is in the Beaux Arts style popular at many American railroad stations, and now dominates the look of the station building, with the 1894 parts forming lower wings on either side. Inside, compared to many union stations, the decoration was quite understated, with a colour scheme of various browns. Features included some rather smart benches, and chandeliers which were latterly replaced with flourescent tube panels as the station’s fortunes declined. It took until the purchase of the station by RTD in 2001 before its revival commenced. After years of planning, architects Skidmore Owings & Merrill (SOM) were commissioned to masterplan and design the redevelopment of the station into a multi-modal public transport hub of the sort which wouldn’t disgrace a public transport oriented city in mainland Europe. The redevelopment would see the building of six improved rail platforms, and their connection to other modes of local transport, along with the redevelopment of what used to be extensive rail yards to the north-west of the station. 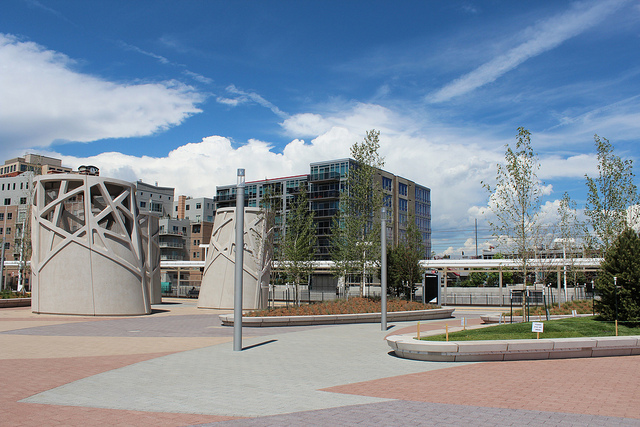 Step one in this process was the relocation of the terminus of Denver’s light rail system to a new stop on the old rail yard site in 2011. SOM’s new light rail station is linked to the rail platforms by a landscaped pedestrian promenade. The light rail station and adjacent bus stop for the free Mall Ride service, features simple but refreshingly lengthy canopies, in a translucent material. Above the rebuilt commuter rail platforms is the signature piece of the new station, which was completed in February 2014. An economical but effective station roof, it is also a very attractive one. It’s made of white PTFE fabric stretched over steel arch trusses, and provides shelter to passengers while still allowing in plenty of light. It swoops down from a height of 21m at each end to 6.5m in the middle. A series of overlapping hoods at each end gives it great drama, but even these are less noticeable than the enormous open section in the middle. This was designed by SOM to give views of the Union Station building from the platforms, and it works spectacularly well. 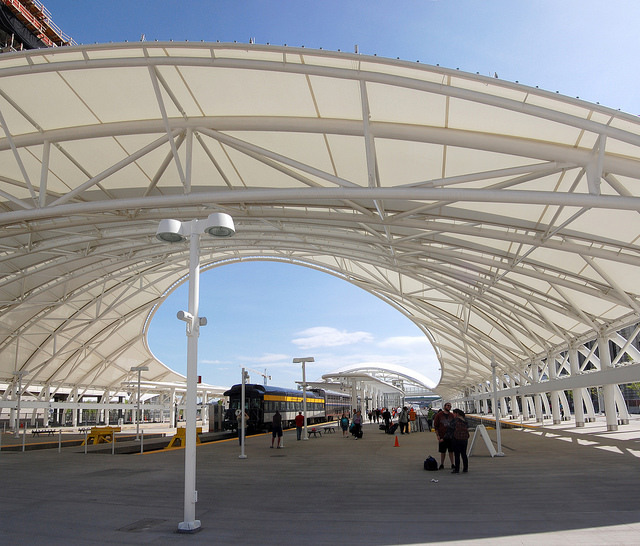 The roof can be read in a number of ways: as a modern reinterpretation of a traditional trainshed (or train hall, to use the preferred American term) roof, as an analogue to the snowcapped Rocky Mountains which overlook Denver, or as a complement to Denver’s airport terminal building, which also features a white fabric roof. Maybe it’s all of these, none of these, or some combination. 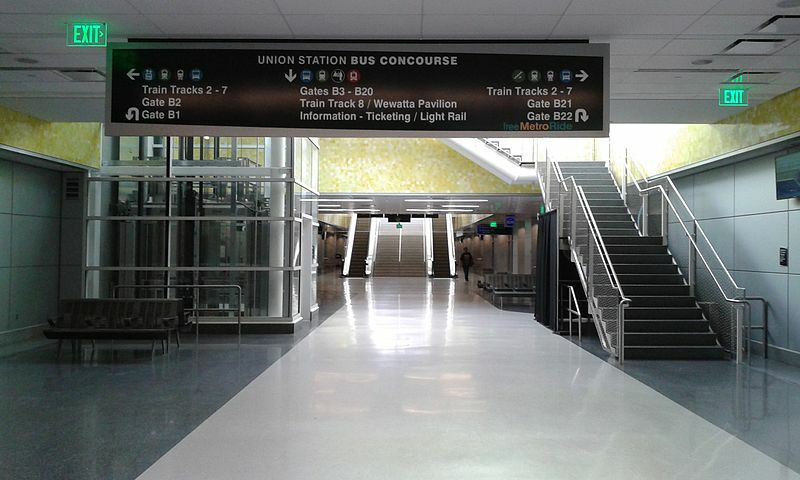 In May 2014, Denver’s existing bus station was closed and replaced by a new underground facility, below the redeveloped station platforms. A 300m long subway starting under the rail platforms continues towards to the light rail station, giving access to bus stands along its length via 22 gates. As well as being the concourse for the bus station, it provides a second, weather protected, route between the rail platforms and the light rail station. While subterranean bus stations can be dark and claustrophobic, SOM’s design is a model of how to provide a pedestrian subway which is attractive and unthreatening. It features several skylights and glass pavilions at surface level to bring daylight down into the bus station, and is decorated in light colours and yellow glass tiling. The bus station also has the most splendid ventilation shafts which make an attractive feature out of what are often aesthetically overlooked structures. The shift in Denver Union Station’s centre of gravity station away from the 1914 building towards the platforms and underground bus station means that the 1894/1914 building has become slightly more peripheral to the operations of the station. Quite rightly, however, RTD wanted to retain it, not least so that it could act as a focal point for the local regeneration programme linked to the station’s redevelopment. As such, it has been retained and sensitively reimagined. Although a small part of the building still provides a ticket office for the railway station, the rest of the station building is now in the hands of the The Crawford Hotel. The vast ticket hall has been lovingly redeveloped as a superb multi-function atrium. 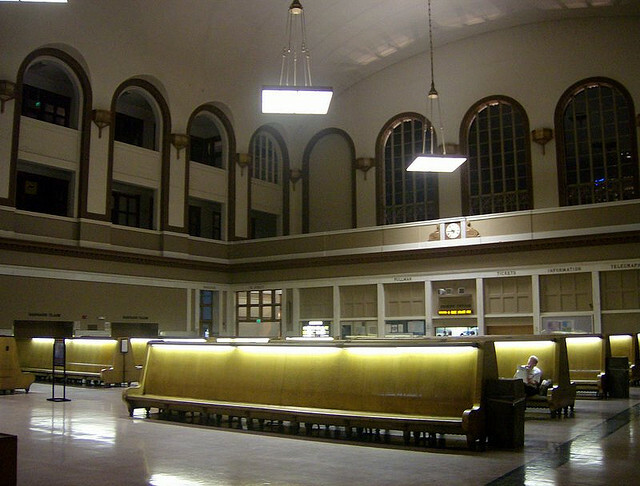 It is simultaneously a hotel lobby, a waiting area for rail passengers, and a local destination for residents and visitors in Denver, with several restaurants at which to eat and meet. New chandeliers have been fitted, the decorative scheme has been changed to white, and the old ticket offices are now the Terminal bar. The stylish benches, however, could not be retained. They acted as outlets for the station’s heating system and contained too much asbestos. Surrounding the ticket hall over several floors are the old offices, which have been turned into luxury hotel rooms, along with space in the attic, where the rooms have exposed and very characterful structure elements. Every time I visit America, I’m convinced it’s going to be my last chance to travel on a long distance Amtrak Superliner service. However, the success and development of commuter rail services in various American cities suggests that passenger trains, and the grand stations they serve, will be around for a while yet, whatever Amtrak’s own future holds.